If you have a 2012 to 2013 model year Cadillac CTS sedan, or 2014 CTS coupe, with the 3.6 Direct Injection V6, verified by the 8th digit of your VIN being a "3", you're on the right page for your vehicle! More minor mods - Exhaust work is small gains on the 3.6, you can install the mufflers you like and gain more sound than horsepower, and there's also the JacFab intake manifold spacer which improves midrange torque and is worth considering if you mainly accelerate in the 3000-4000rpm range. Overkill is proud to be a specialist of the GM Direct Injection V6 family and with a special focus on the 3.6 LFX V6. With Overkill tuning, you'll notice right away much improved throttle responsiveness and acceleration and improved transmission performance which will feel lighter and easier to drive. We also support many of our exclusive performance products including E85 flex fuel tuning. Autocal Handheld: The best way for us to provide 2012+ CTS 3.6 tuning for you is through our Autocal handheld system. The Autocal handheld allows you to take the handheld to the vehicle, read the factory file, upload our Overkill tunes and provide scan data, with no laptop required. Return to stock calibration whenever you want, apply updates and retunes easily through email with us and Overkill retuning is available at no charge for as long as you own your CTS. This combo pairs Overkill Tuning through our Autocal handheld with our E85 Flex Fuel kit. You'll get Overkill tuning for 87 and 91/93 octane gasoline, plus tuning for E85 Ethanol fuel which out performs its gasoline counterparts. 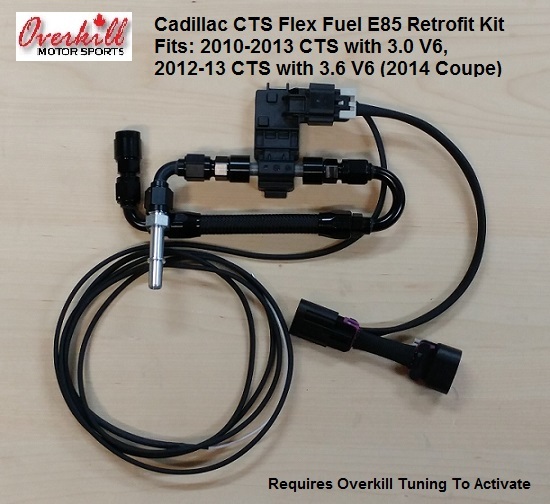 The flex fuel kit retrofits a GM flex fuel sensor into the fuel system, and relays a precise ethanol content of the fuel in the system to the computer. In combination with Overkill tuning, the computer will adjust air/fuel targets for any ethanol blend. You can switch between gasoline and E85 ethanol as desired without requiring any changes to the vehicle once this kit and Overkill tuning is installed. Simple installation will take you 30 minutes. This is by far the best bang for your performance buck on a 3.6 LFX V6! This kit bolts to the stock intake manifold with no tuning required, yet works best when used with a ported intake manifold modified to a matching 80mm inlet. 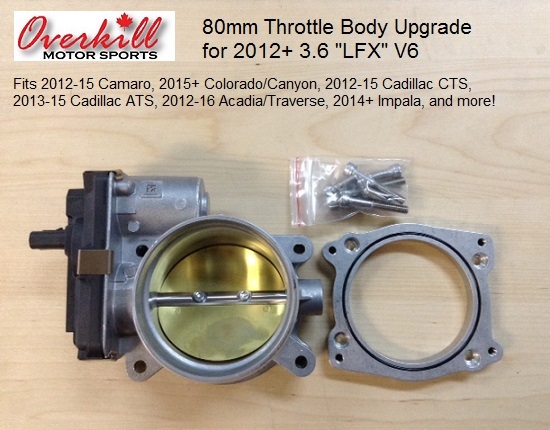 Kit uses a brand new throttle body with an aluminum adapter plate and stainless steel bolts. Newest kits now come with an o-ring seal! There is no core charges, we don't need you to send in your factory throttle body. Tip: This throttle body has a 3.5" clamping area, compared to the factory throttle body of 3". Ensure you have a solution available before installing the throttle body! Look below for what we offer for your current intake.